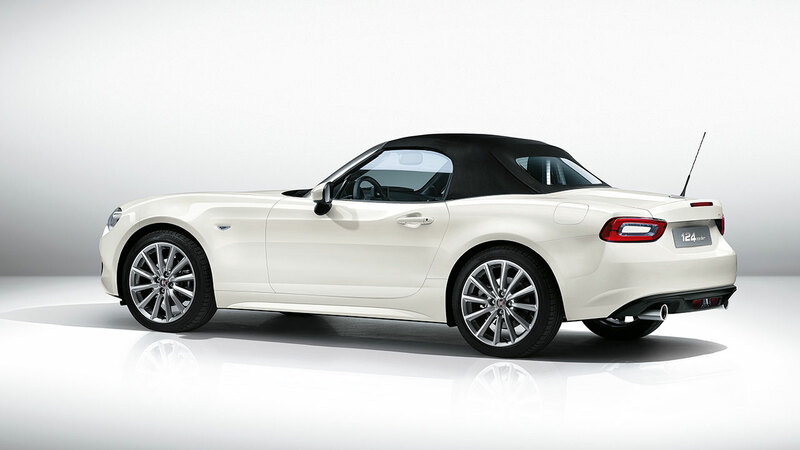 The new FIAT 124 Spider is unveiled for the first time to European audiences at the 2016 Geneva Motor Show, reviving a storied nameplate and bringing classic Italian styling and an authentic roadster driving experience to a whole new generation of enthusiasts. 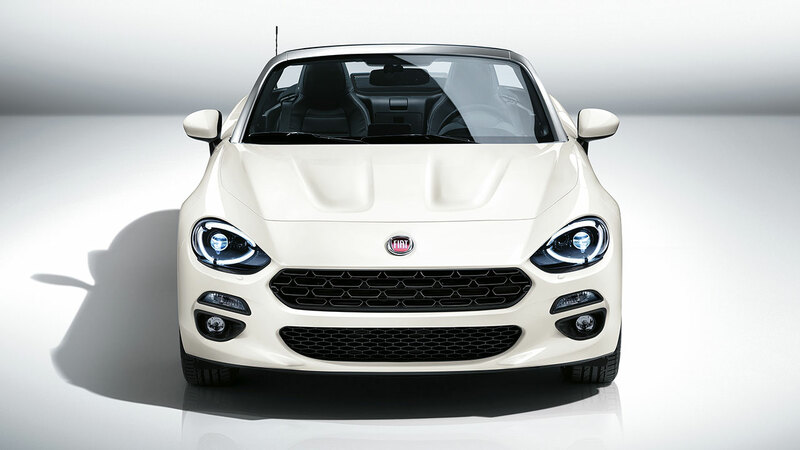 Designed in the FIAT Style Centre, the front-end of the 124 Spider encapsulates the essence of its classic predecessor in a modern and bold package - broad and muscular but not too aggressive. The profile view is pure classic roadster too, with a long wheelbase, a cockpit hunkered low near the driven rear axle and a long bonnet complete with twin power domes – another nod to the bigger-engined versions of the original 124 Spider. 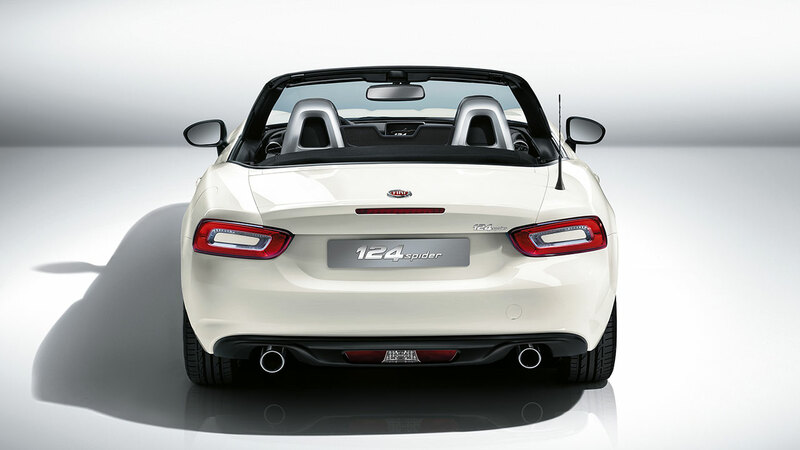 The look of the rear is defined by bold “floating” tail lamps shaped to hark back to later versions of the original roadster, while other classic cues include the rear wings that cascade inwards across the boot lid and the FIAT badge mounted on top of rear spoiler rather than facing rearwards as on all other FIAT products. To minimise weight, improve longevity and encourage spur-of-the-moment open air driving experiences, the multi-layer hood is a manual unit that can be operated in seconds using minimal force and without the driver having to leave their seat. 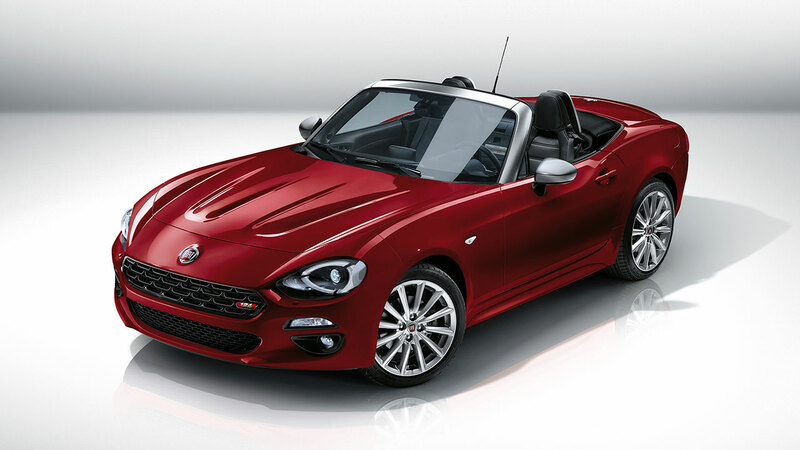 Under the 124 Spider’s distinctive bonnet lives FIAT’s proven 1.4-litre, MultiAir, turbo-charged four-cylinder engine, which delivers 140hp and 240Nm of torque. Mated to a six-speed manual transmission, the FIAT 124 Spider is capable of accelerating to 62mph/100km/h in just 7.5 seconds and has a top speed of 134mph/215 km/h. 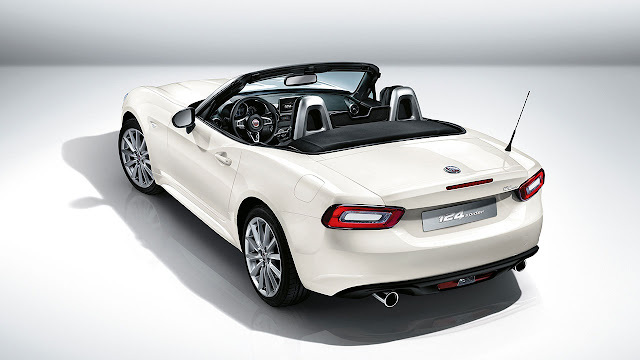 The 124 Spider's suspension uses a double-wishbone layout in front and a multilink in the rear, specifically tuned for greater stability while braking and turning, while the electric power steering system has been specifically tuned to give the Spider a responsive Italian feel. 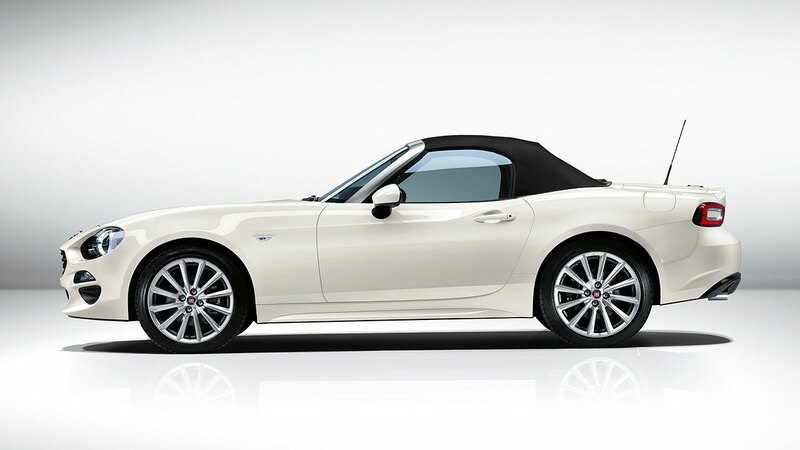 Combined with the lightweight architecture and balanced weight distribution, the turbo-charged FIAT 124 Spider offers a dynamic and exciting driving experience without compromising comfort and refinement, thanks to the adoption of an acoustic front windscreen and additional insulation treatments. Trim levels are still being finalised for the UK ahead of its launch in the third quarter of 2016, but standard equipment on all versions is expected to include four airbags, air conditioning, a leather steering wheel, cruise control, 16-inch alloy wheels, USB, AUX and Bluetooth connectivity and keyless start. 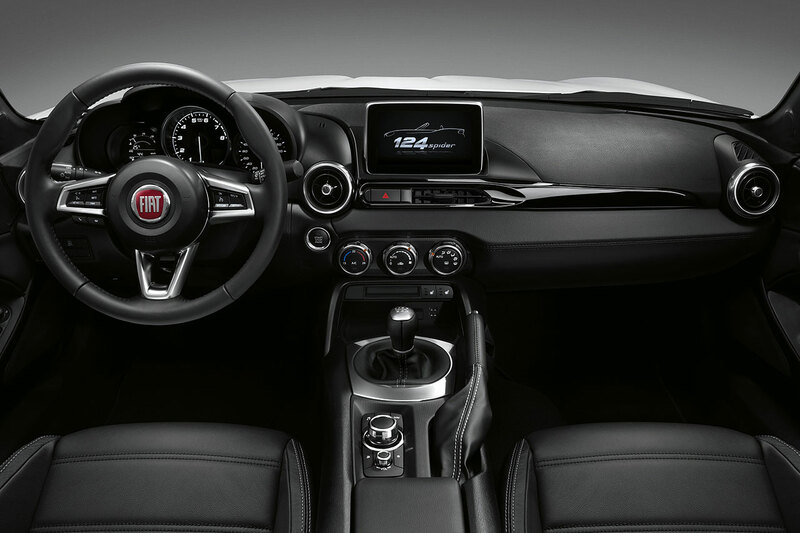 A seven-inch touchscreen infotainment system, satellite navigation, 17-inch alloy wheels, full LED adaptive front lights, leather upholstery, a BOSE sound system (including stereo headrest speakers), front fog lamps, climate control and different surface finishes are expected on other versions. 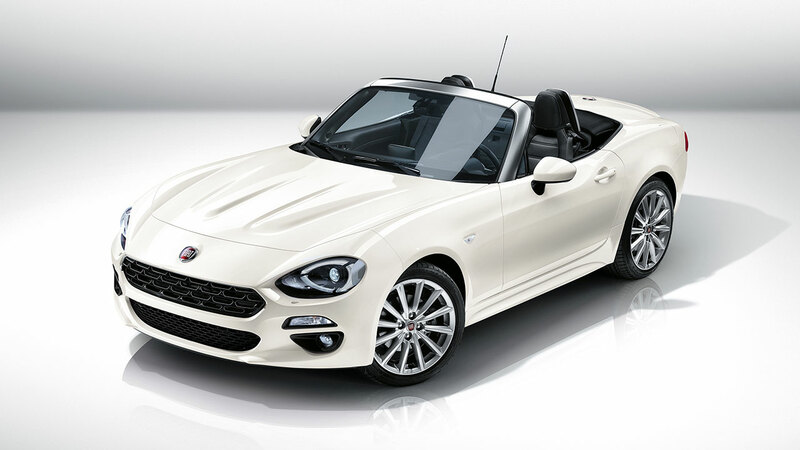 To mark the launch and celebrate 50 years of the unveiling of the original FIAT 124 Spider in Turin in 1966, a limited Anniversary Edition has been created. Enquiries are invited for this exclusive special edition, of which only 124 numbered examples will be available for the UK market. Priced at £23,295 OTR, the Anniversary Edition’s unique equipment specification includes full LED adaptive headlights; seven-inch touchscreen infotainment system with multimedia control knob; satellite navigation with 3D mapping; DAB radio; two USB ports; Wi-Fi and Bluetooth connectivity; nine-speaker BOSE audio system; automatic lights and wipers; 17-inch alloy wheels; a premium silver finish on the door mirrors, windscreen frame and roll bars; "Anniversary Edition" numbered plaque and the 124 Spider badge on the front grille.